The Kentucky Genealogical Society and the Kentucky Historical Society co-sponsor a Family History Workshop on the second Saturday of each month at the Kentucky History Center in Frankfort. Each workshop is designed to present information on genealogical and historical research, and includes programs by subject matter experts. KGS also sponsors an annual conference each August that features a well-known speaker and numerous vendors. For more information on the KGS/KHS Workshops, visit the KGS website. 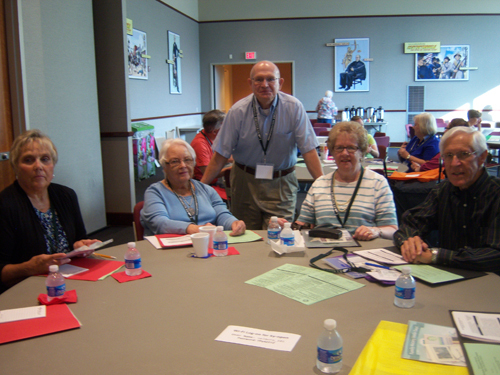 At left, several members of the Scott County Genealogical Society and their friends attended the annual KGS conference on August 2, 2014. The conference was held at the Kentucky History Center in Frankfort. 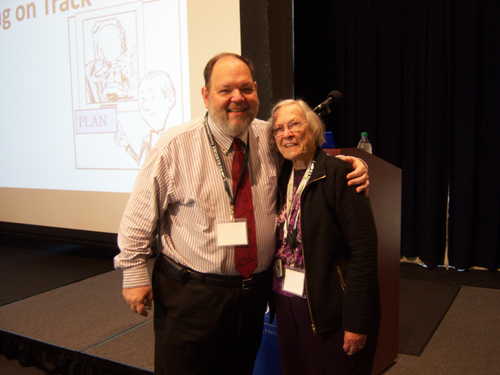 In the photo on the right, 2014 conference speaker Mark Lowe (left) and SCGS President Nancy Giles posed for a picture. Lowe's presentations dealt with several aspects of genealogy, and they were very informative.